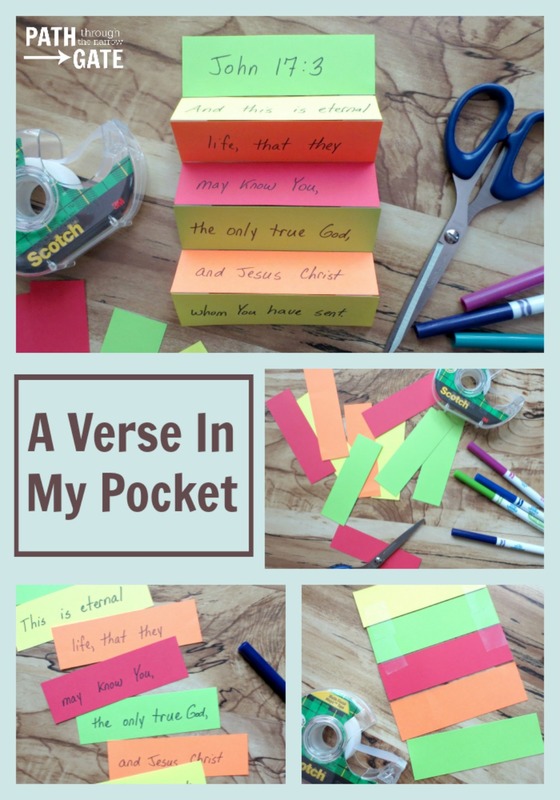 If you teach Sunday School, you need Sunday school games that your kids will love. You need exciting, active, kid-friendly games that you can pull together quickly, that don’t require tons of expensive supplies, and that will keep your students engaged. 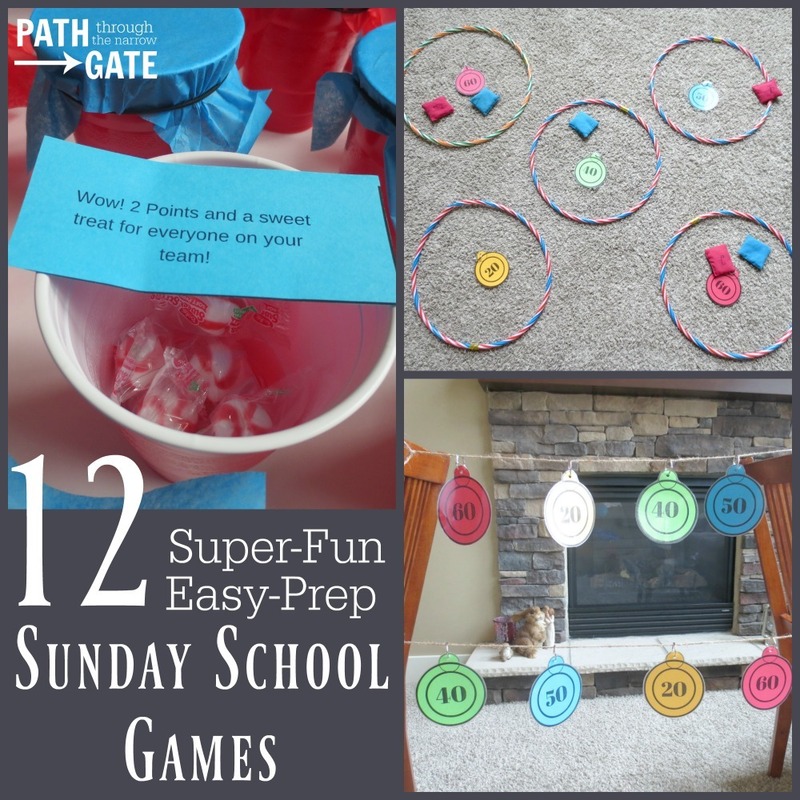 Here are 12 super-fun, easy-prep Sunday school games your students will love. Each of these games can be used with questions from the lesson that you are currently teaching. These games are are sure to add some excitement to your class. Best part? 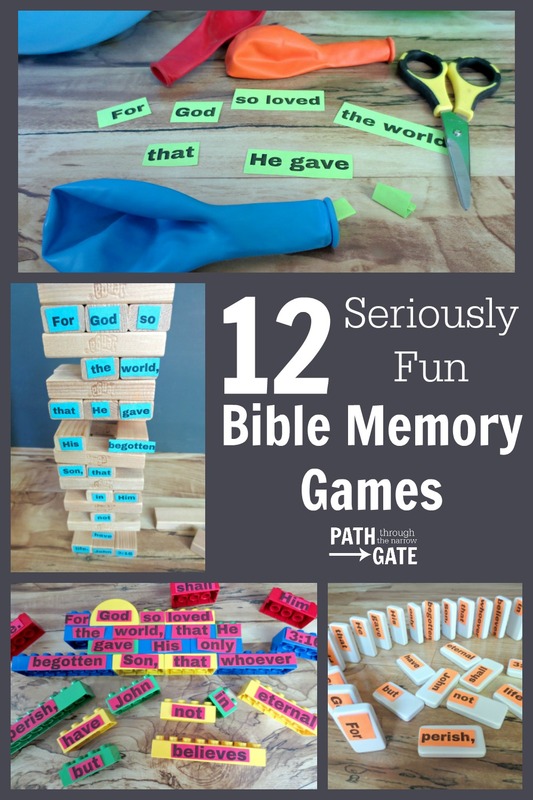 Once you find 5 or 6 of these games that your class loves, you can keep the supplies on hand, rotate through those games, and never have to wonder what you will do with your kids in Sunday school each week. Good bye to the Saturday night blues! To Play: Choose one student to watch the stop watch. Start the stop watch at a time such as 3 minutes (your time will depend on how many questions you are asking.) Ask the students the first question, then say “Go”. Anyone in the class can blurt out the answer after the teacher says go. If the student answers correctly, the teacher goes immediately to the next question. If the student answers incorrectly, the person holding the stop watch will count down 3 seconds. During those three seconds, no one is allowed to answer the question. At the end of 3 seconds, the teacher will say “Go” again, and the students have another opportunity to answer the question. If the class does not get through all of the questions in the designated time, play the game again using the same questions. See how much faster the students are now that they have heard the answers once. The only obstacle? If they get the answer wrong during this round, 5 seconds are counted off before they can answer again. 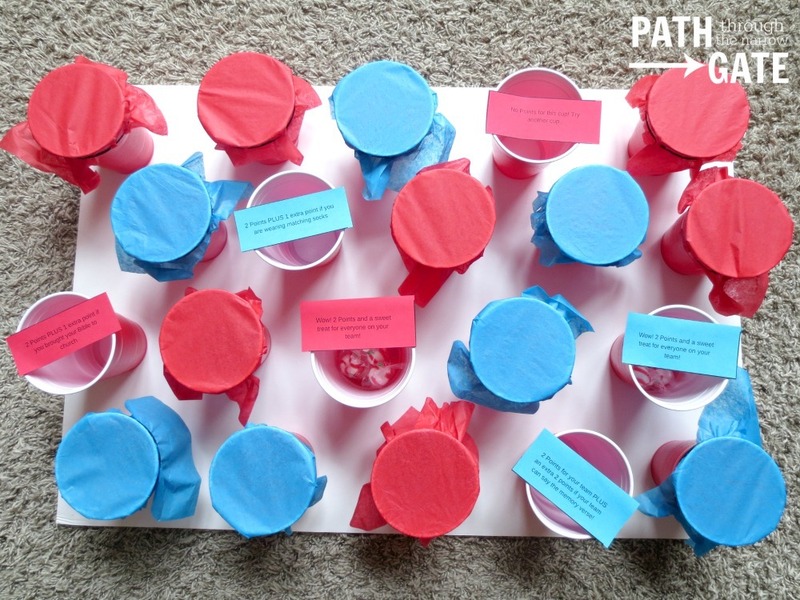 Reward the class with a sweet treat if they beat the clock! 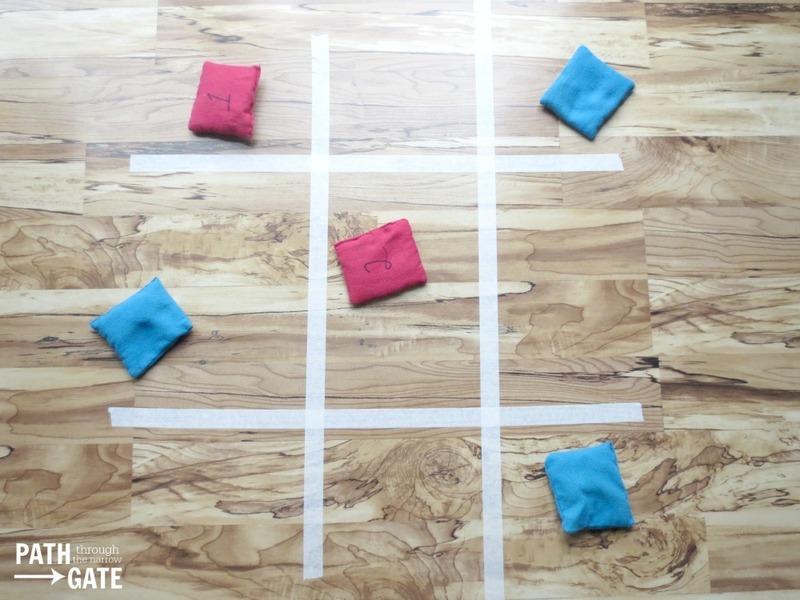 Set up: Use the Masking Tape to make Tic Tac Toe board pattern, three columns by three rows. Set up: Place the hula hoops on the floor. Mark a “start line” for the kids to throw from. (If your kids are young, place the hula hoops fairly close together, and close to the start line. If your students are older, move the hula hoops farther apart and farther from the start line.) 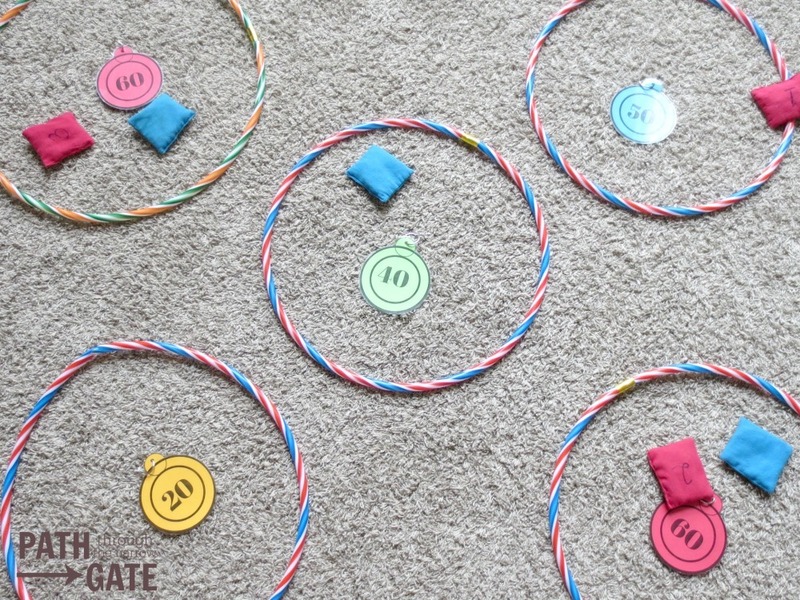 Place one Point Value Circle inside of each hula hoop or ring. To Play: Divide the class into two or more teams. Give each team the same number of bean bags. Ask the teams questions, alternating between teams. When someone answers a question correctly, they will stand at the start line and throw the bean bag into a hula hoop. If they get their bean bag into a hula hoop, their team is awarded the number of points indicated on the Point Value Circle. 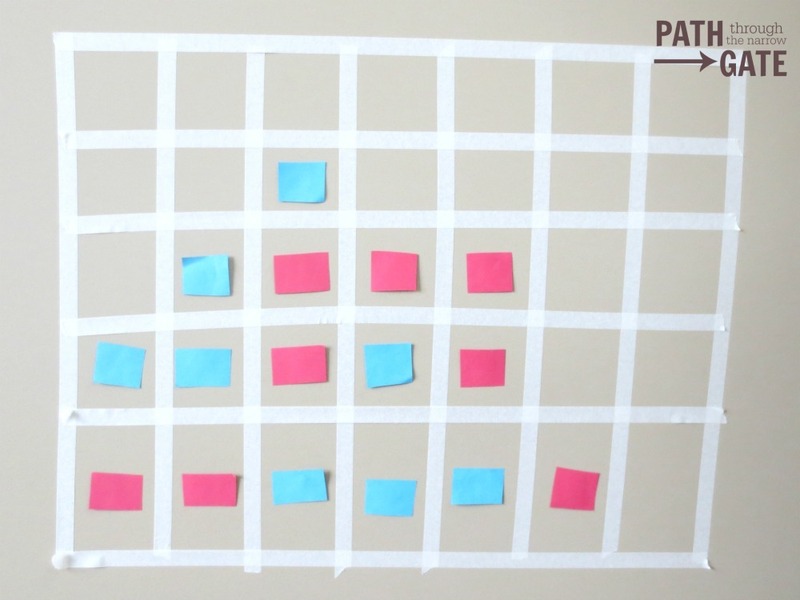 Set up: Using the masking tape, create a “grid” with seven columns and five rows on your flat surface. To Play: Divide the class into two teams. Alternating, ask each team a question. If they get the answer right, one person from that team can take a sticky note or colored paper circle or square and put it on the box of their choice on the grid. However, within a column, you can only fill the grid from the bottom up, just as in the game “Connect 4”. It is then the next team’s turn. The object of the game is to be the first team to get four in a row, vertically, horizontally, or diagonally. Set up: There are all kinds of variations of this “Punch the Cup” game on Pinterest – and it’s super easy to make! Using the hot glue gun, glue the bottom of the cups to the Poster Board. Place a small treat inside each cup. Then, cover the mouth of each cup with the tissue paper. Secure the tissue paper with a rubber band. To Play: Ask your students questions. When someone answers a question correctly, they may come to the front and “punch” the paper tissue on one cup and get the prize on the inside. Variations: You could divide the class into teams, then place question papers into each cup. One person from a team gets to come up, punch a cup, withdraw the question, and attempt to answer it. 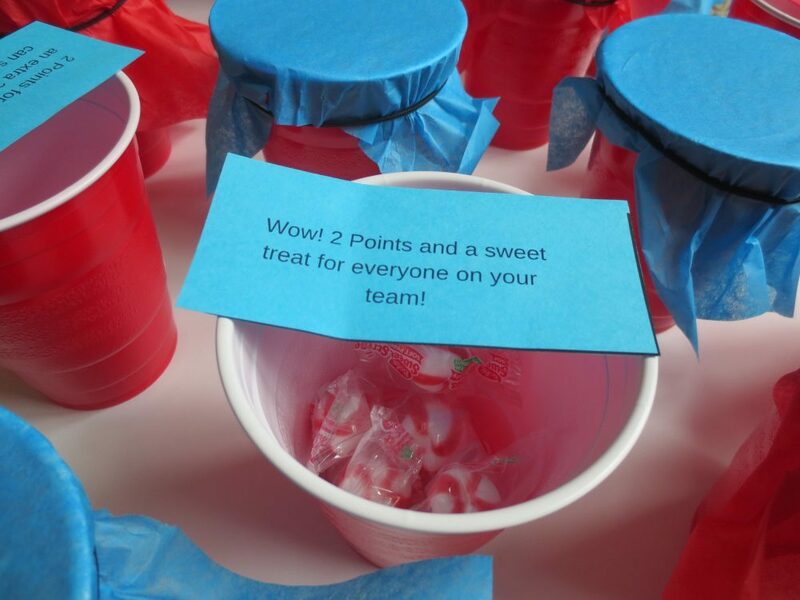 You could also include cups with prizes or “free points”. 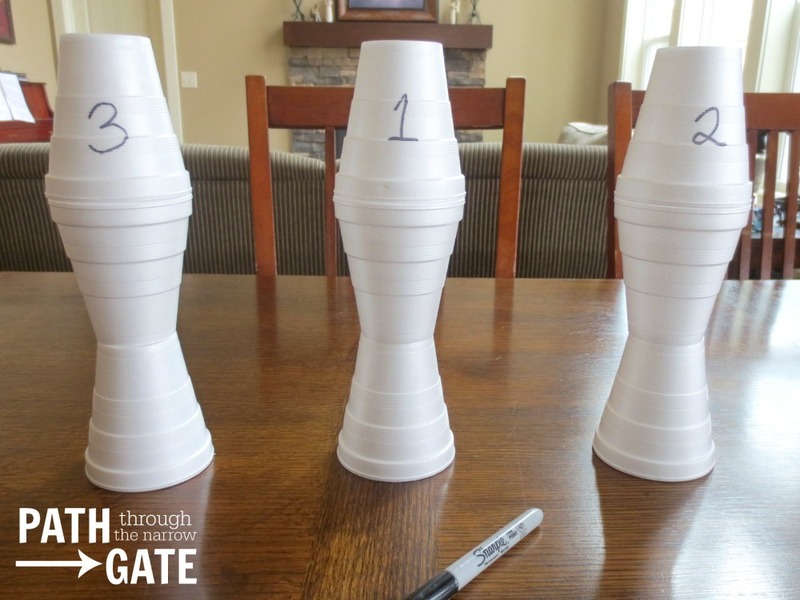 Another way to play might be by putting point values into the cups. When a team answers a question correctly, one person gets to come up and punch a cup to see how many points their team gets. Here are the “Punch a Cup” paper slips I put in the cups for my class. I printed these questions on two different colors of paper, slipped them into the cups, and covered the cups with two different colors of tissue paper, one for each team. Once you make the cup board, you can use it multiple times. To Play: Divide your students into two or more teams. Line the students up by team, facing the basket, with the first person on the team facing the basket and the other students on his or her team standing behind. Alternate asking each team a question. When a team answers a question correctly, the front person from that team gets three chances to score points by throwing the ball into the basket (they could score 3 points if they make 3 “baskets”.) Then, they head to the back of the line. Alternately, you could give the first three students in line a chance to throw one time each, then head to the back of the line. Continue play until the questions are finished, then tally the scores to find out which team wins. Note: If you have very young kids, a laundry basket might make an easier target than a trash can. Set Up: Have the table and Styrofoam cups ready to go. To Play: Divide your students into two or more teams. Alternate, asking each team a question. When a question is correctly answered, a member of that team may take a cup and place it on the table, making a foundation, then stacking as they go. Each team will use the cups to build their own cup “tower”. The object of the game is to see who can build the highest tower – before the cups come tumbling down! 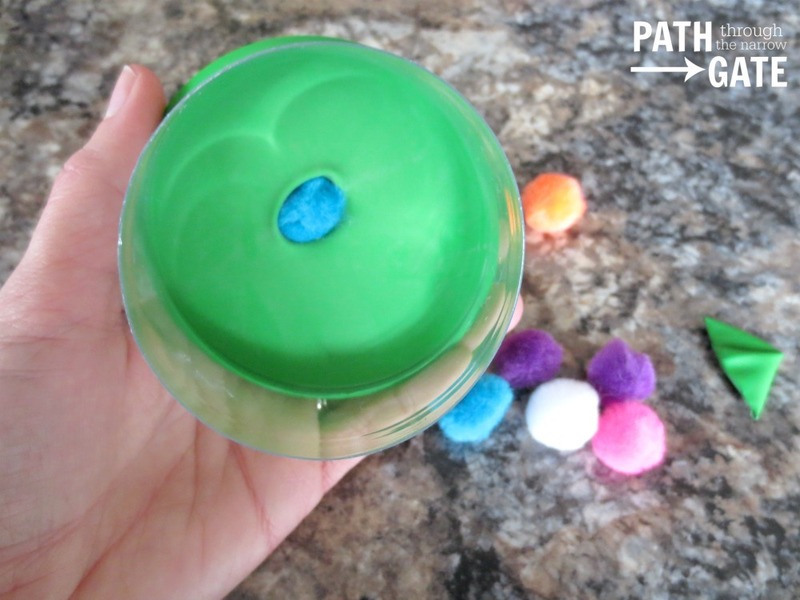 Before using this game, you will need to assemble the Pompom shooters (this project is for adults, only). 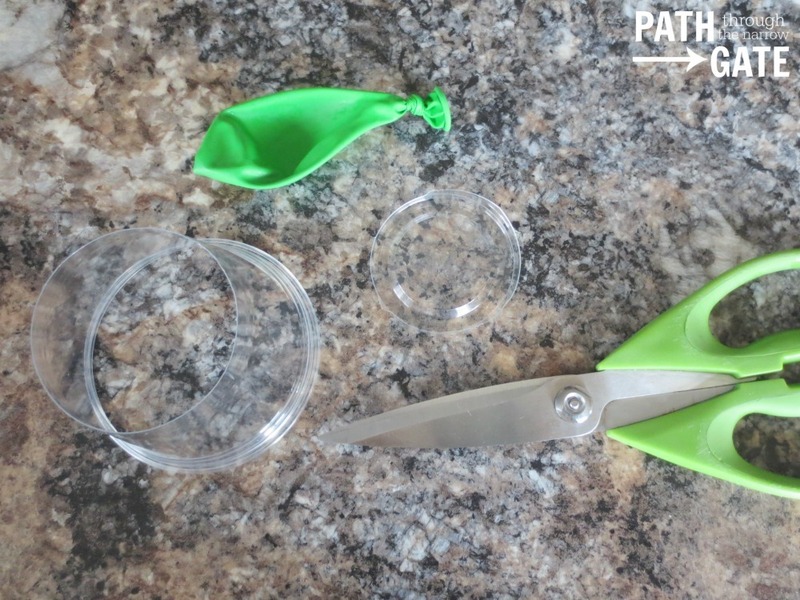 Using the exacto knife, carefully make a small puncture near the bottom of the plastic cup. Use the scissors to cut the bottom of the cup off. Make sure that any sharp edges are trimmed away. Without blowing it up, tie the end of a balloon. Then, cut off the top of the balloon. 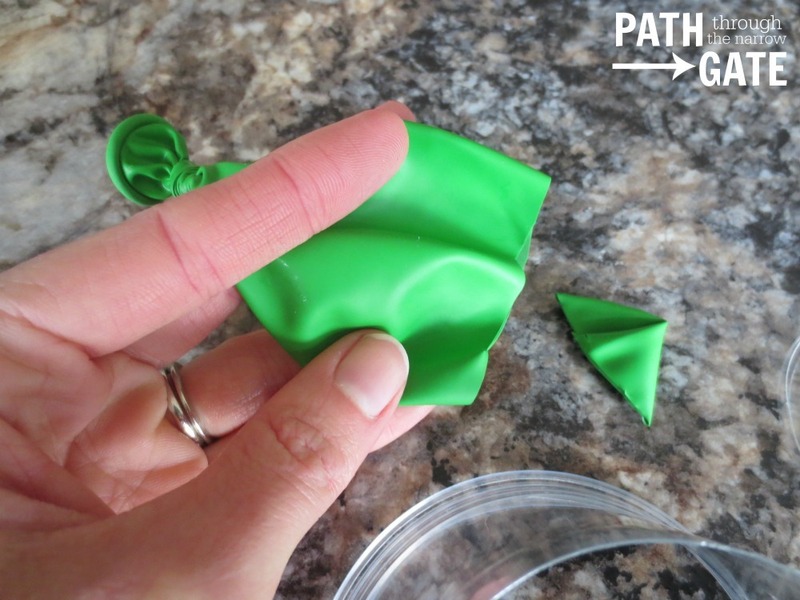 Carefully stretch the balloon over the mouth of the cup, with the knot facing up and away from the cup. 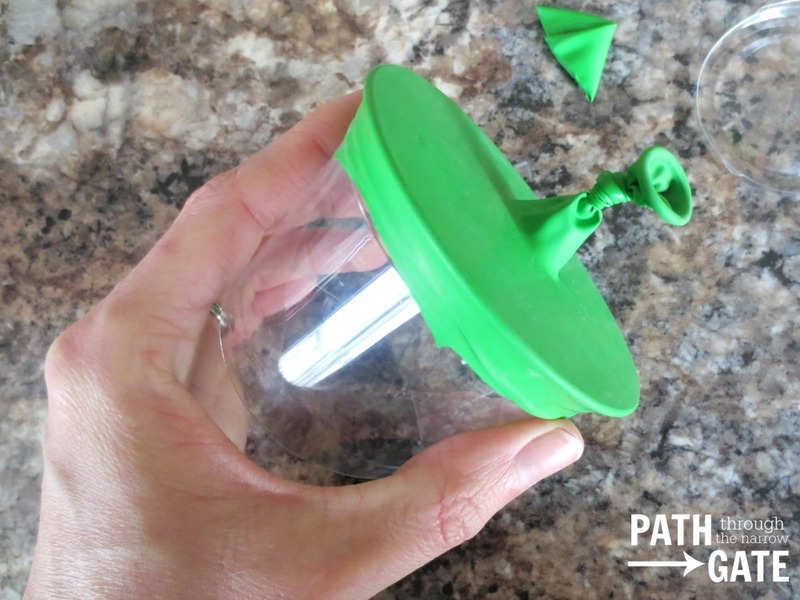 Secure the balloon edges to the cup with the masking tape, if needed. To Play: Divide your students into two or more teams. Choose one person from each team to hold the hula hoop. Have the teams stand in lines, with the first person facing the person holding the hula hoop. Alternate between the teams, asking questions. If a team gets the correct answer to a question, the person in the front of the line gets three pompoms and three chances to shoot their pompom through the hula hoop. The team gets points for each pompom that goes through the hula hoop. Set Up: Arrange two rows of chairs, each chair facing forward (like a train), one chair for each student. To Play: Divide the students into two teams. Have one team sit in one row and the other team sit in the other row. Let the kids know that they need to be listening for a particular phrase. Whenever they hear this phrase, the first person to say “Train Chair Challenge” will get an extra point for their team. (You could alternately use a funny phrase, a part of a verse the class is memorizing, or a point you want them to remember.) In this challenge, only the two people sitting in the front chairs may answer a question. Set Up: Create a Hula Hoop coarse by placing the hula hoops in a meandering line. Stagger them so that kids can jump from hula hoop to hula hoop. To Play: Divide the students into two teams. Have one team stand on each start line, in a line with the first person facing the hula hoops. You will ask a question to team A, then say “Go”. Team A will try to answer the question as quickly as possible. Meanwhile, Team B will be jumping from Hula Hoop to Hula Hoop trying to get as many people as possible across the opposite line. Only one person can be in any Hula Hoop at a time. As soon as the first person has jumped out of the first Hula Hoop, the second person may jump into the first Hula Hoop. As soon as Team A correctly answers the question, the teacher calls “stop”. Team B will get points based on how many people crossed the finish line before Team A correctly answered the question. The next question is given to Team B and Team A will try to get people through the course before Team B correctly answers the question. Variations: To change the game, alternate the way the kids jump through the hula hoops – one foot at a time alternating feet, or “bunny hopping” with both feet at once, etc. 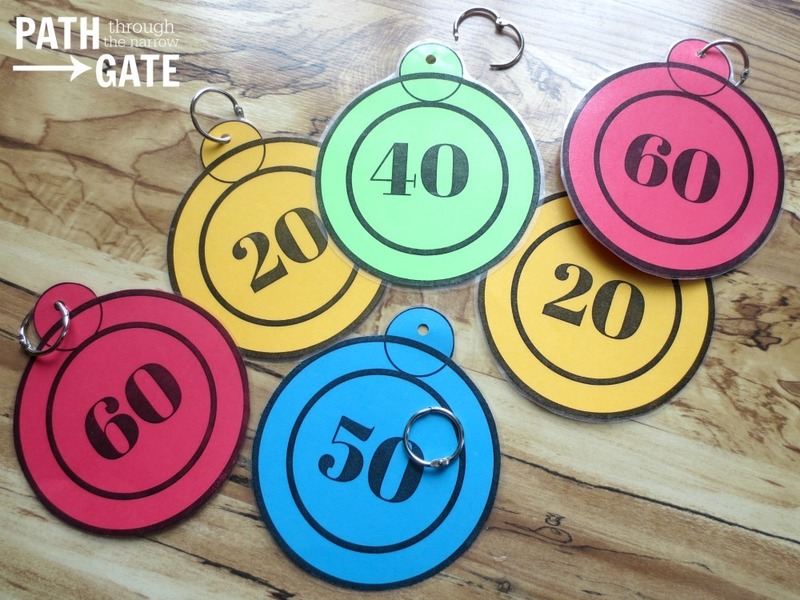 Materials: Point Cards on individual metal binder rings, Twine or string, two Chairs, Two or More Bean Bags, Hacky Sacks, or foam balls, List of Questions, Start Line. Set Up: Tie a piece of twine to one chair leg or back. Thread the Point Cards with the metal binder rings onto the twine. Tie the other end of the twine to the other end of the chair. You may want to make this double or triple layered with two or three pieces of twine and the point cards spaced between. Make a start line. To Play: Divide the students into two or more teams. Have the teams stand in a line, with the first person in each line facing the Point Cards. Ask questions alternating between teams. If the team answers the question correctly, the first person in the line can throw the bean bags three times, attempting to hit a point card. Once he or she hits a point card, his or her team gets that number of points. You could also have three people from the team each get one try to keep the game moving faster. Have the person (or people) at the front move to the back of the line after they throw. Then, ask a question to the second team. Continue alternating questions and adding points to the score. Materials: Table, Styrofoam Cups with points marked on them, Two or More Bean Bags, Hacky Sacks, or Foam Balls, List of Questions, Start Line. Set Up: Place the Styrofoam cups on the table, in a line. 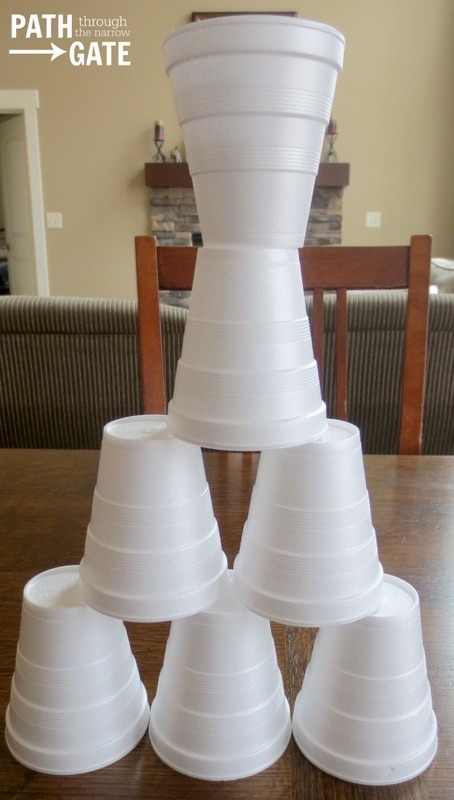 To make the game more fun, you make want to stack two or three cups (upside down, upside up, upside down) to make a “tower” that the kids can knock over. Place the “point” cup on the top. Set up at least five different cups or “towers” for the kids to aim at. Place a start line on the floor. To Play: Play this game exactly like the Bible Question Arcade Game, but have the kids try to knock the Styrofoam cups over or off the table. Their team will get any points that are knocked down. Set the cups back up after each question. A Smart Teachers’ Must Haves: Masking Tape, Twine, Balloons, and Bean Bags are great to always have on hand. Use the masking tape or twine to quickly make “start” and “finish” lines or to divide your room into two sections. If you ever run out of activities before you run out of time, you can always pull out the bean bags or balloons and play “Hot Potato”, “Monkey in the Middle”, or “Keep the balloon off the floor”. Bean Bags: Don’t have multi colored bean bags? Write numbers on them with a sharpie marker, for “team 1”, “team 2”, etc. You could also draw color dots or shapes on the bean bags for younger kids. Hula Hoops: Hula Hoops are another favorite Sunday School prop. They can be found at many Dollar Stores. 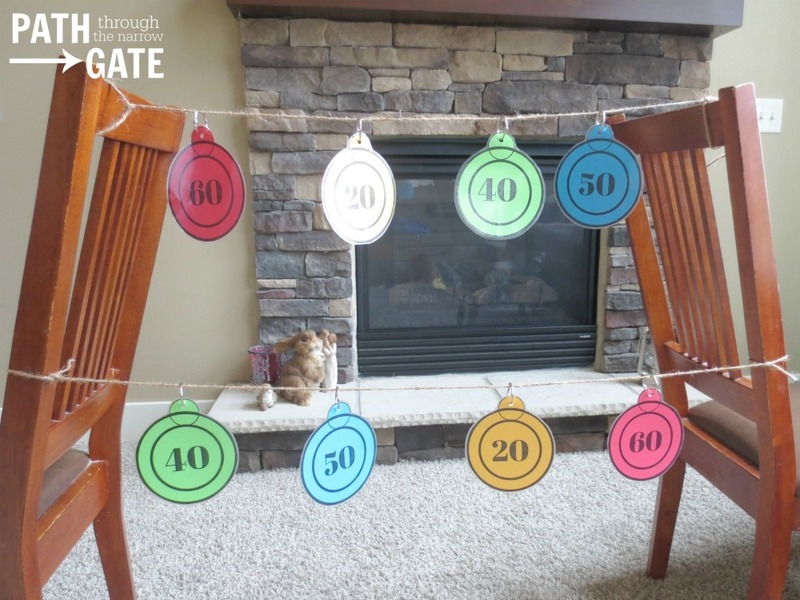 Point Cards: Here are some printable Point Cards that can be used with several of these games. I printed mine on multiple colors of paper and covered them with clear contact paper to make them last longer. (You could also laminate them.) I then punched a hole in the top, and inserted a single binder ring (found in a bag or box in the “school” section of my local grocery store.) in the top of each one. Student Participation: Does one student answer all of your questions? Encourage other students to participate by asking them questions directly. Or, have a rule that each student can only answer once, to encourage more participation. Do you have kids that HATE to be put on the spot and refuse to answer questions? Use “team” games where anyone on the team can answer a question. Allow only one person from each team to throw the bean bag (or whatever the activity), so that everyone gets a chance at the “fun” point scoring part. For example, you ask a question and Sally answers. But, Sally has already answered and gotten a chance to throw the ball. Now, Sally must choose someone else on her team to throw the ball who hasn’t gotten a chance yet. Sally chooses Joey, a new boy who wouldn’t be able to answer a question from last week’s lesson. This method allows Joey to still participate and feel like a part of the team, even if he doesn’t know the answers to the questions. 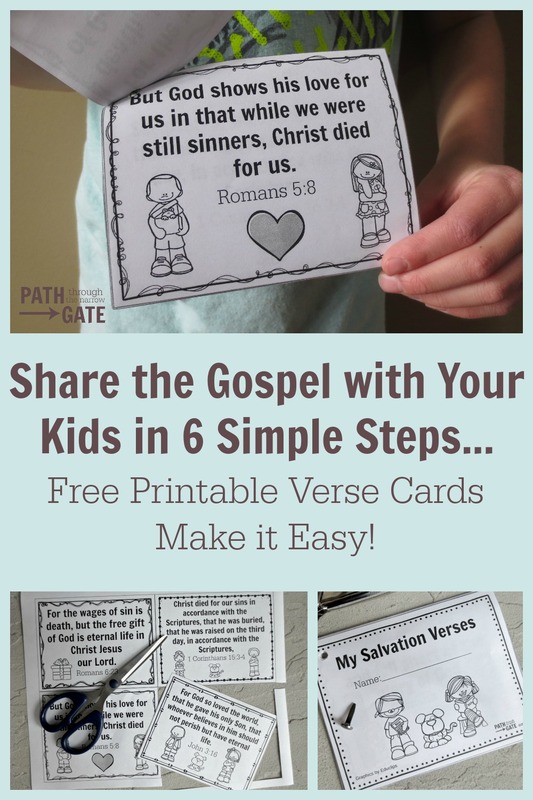 Do you have any great Sunday school game ideas? I would love to hear your suggestions. Please scroll down to comment.